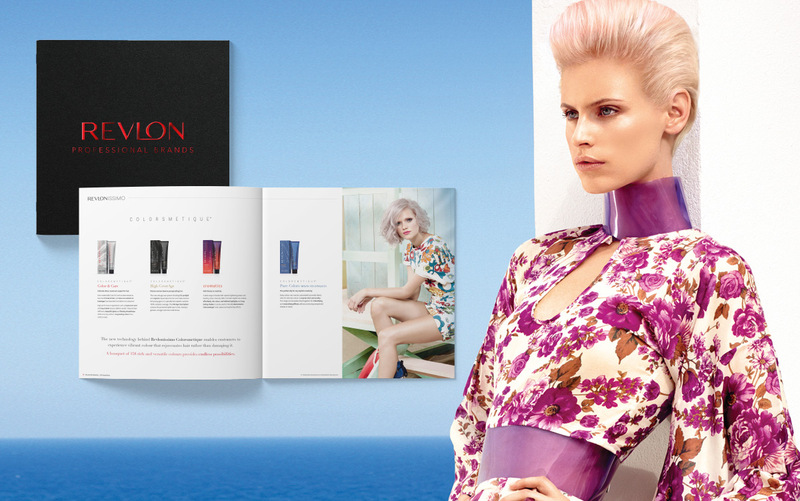 Showcasing a brand: Revlon Professional Australia. Revlon Professional owns and markets numerous brands and products across Australia. As the company has grown, made acquisitions, and developed new offerings, their voice became confused and lacked a cohesive strategy. Their existing product information was a piecemeal network, communicated across many different web and print materials. Being disjointed in both location and visual style, this information made it very difficult for the public to perceive the full scope of the company. We needed to paint a complete picture of Revlon Professional which was concise, unified, and easy to understand. The brand portfolio we created is Revlon Professional’s single most important marketing touchpoint. It connects with salons, is used as a tool by representatives, and has a long shelf life. Working closely with the Marketing Director, we developed a modern engaging concept for the book that would best capture the attention of stylists and salon owners. We researched all written information available and completely rewrote all the content from the ground up, creating a user driven hierarchy that provided clarity across all brands. This industry is very visual but also driven by solid product information. By stripping back the content and reducing its focus on less relevant technical specifications, we were able to let each brand shine through. “lcdc.co understood from the outset what the problem was and created a seamless design that took the complex structure of our many brands and made them flow in cohesive and logical fashion.